Amazing views from home, hot tub, decks and sport court! Canoe, kayak included. This beautiful seaside cabin sits high, near the tops of the trees, where the eagles are often seen to fly! You'll find a gorgeous, clean, and comfortable lodging experience, in an unpretentious - yet delightfully charming cabin, with the character you'd come to expect of a Pacific Northwest coastal home. Large expansive windows look out over the ocean and the Cascade mountain range. This is the perfect relaxing getaway for a couple, your family, or a group retreat. There's plenty to do with a full size sports court, barbeque pit, recreation room, large two tier deck, hot tub, golf nearby, state parks, boating, biking, or simply relaxing with a book by the fire. Also there's access to the beach! The home has three stories with room to sleep 8 comfortably ... three queen beds; a kids room with two bunk beds; a futon, and a sleeper sofa. 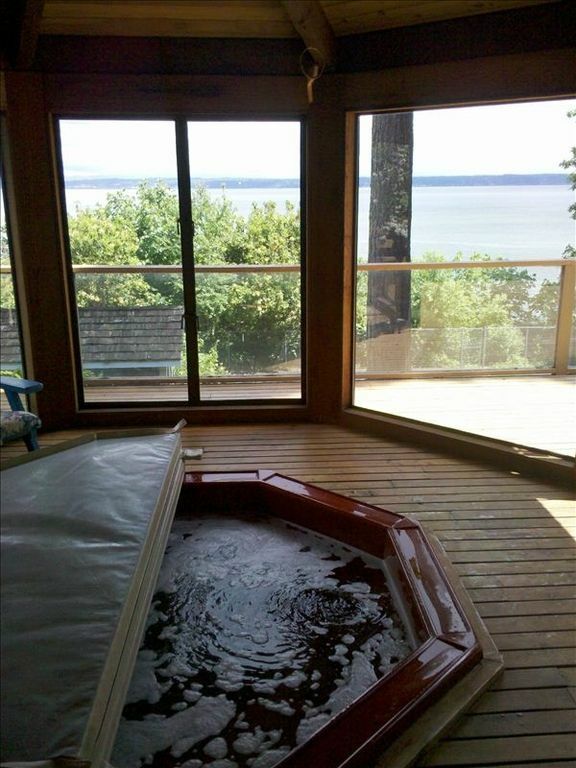 Camano Island's Eagles Nest provides a spacious and naturally bright, yet cozy seaside vacation getaway. With the entire cabin to yourself, you're free to truly relax the way you deserve. The view looking over the serene and majestic landscape is enough, in and of itself to leave you mesmerized. You'll love this vacation getaway retreat and wish you could stay forever! We've never seen such beautiful views, from such an incredible home, with so many recreational amenities so close to the city of Seattle. It's so close to where we live, yet seems like a world away. The feeling you get looking out with such amazing views while being a part of nature makes provides for the perfect relaxing getaway. One step up to the front deck then everything needed on main floor. Full-sized sports court; weight room; picnic area; hot tub and gazebo; poker/foos/pool table; bike, canoe and sea kayak for guests. Perfect for our short weekend. Property is well kept with a nice kitchen and living area. Bedrooms are comfy and spacious. The view is spectacular and we only wish we’d had more time to spend there and enjoy the home, the water and the serenity. Very comfortable. Amazing views! Loved the hot tub! This is a wonderful place to get away for a while. Our group loved it! Has fantastic views and fully equipped. Access to the beach is a bit tough to get to, but we enjoyed our stay. Not at all what we were expecting. First of all the house is advertised as “Sleeps 8”, yet we were charged $250 extra for having 8. The explanation I received was, “The property allows up to 8 people, but this is the only way to give smaller groups a price break.” Huh?!! The house seems tired - definitely not spotless as described. The fitted sheets had some long, dark hairs when we pulled the sheets back - I was totally grossed out by that so I ended up sleeping at my sister’s house. We ended up lint rolling the sheets and sprayed them with Lysol. The beds are advertised as queen sized for three of the bedrooms, which the bed in the loft was a double. All pillows were flat as pancakes, so we bought some pillows for our use. Some of the drawers and cupboards in the kitchen were a disaster - it looked like someone had rifled thru them and just dumped junk in them. The refrigerator had a broken door shelf which fell off when we opened the door to add some items - it had been taped on, but obviously that didn’t work. When I let Jenn know so we would not get blamed, her response was that it was too expensive to buy a new fridge. I would think they could order a shelf. The first item on the checkout sheet mentions starting a load of sheets in the washer, yet no washer and dryer were available. I have never stayed at a VRBO that did not have a washer and dryer. On a bright note, the outside views were beautiful! If you are a traveler who enjoys the experience of staying in someone else's home, please read all of our 5 star reviews and then come enjoy the Eagles Nest. This home has been with the family for many decades. Yes, over that time we have put together a pretty comprehensive junk drawer! We don't expect you to want or need anything in there, but feel free to look if you'd like. If you prefer daily housekeeping and glasses that come wrapped in plastic, then we don't mind saying that is not what we are offering. Every single pillow was brand new the day this group checked in. We've found that most travelers who have specific pillow preferences, tend to bring their own. My response about the fridge was misquoted - it's not the shelf that's broken. A previous guest accidentally pulled the shelf out of the door and now it can't be reattached. Since it's a pretty new fridge that works great - we do just fine without using that shelf. Our rental rates are based on the size of the group. Why should 4 people have to pay the same as 8? This is all clearly quoted before anyone makes a payment. This house is so close to the water, that we need to be very careful with the septic system. We have opted to eliminate the washer and dryer so that we can still allow 8 people and ensure everyone gets plenty of showers and flushes. No one wants to do laundry on vacation anyway! Great time! Only down side was that it was just too short. Had a great time! Relaxing. Beautiful view. Clean. Cozy. Highly recommend. Wonderful property! Everything you need for a relaxing vacation. A quiet home away from home. Kitchen is equipped with everything you need. Very clean and organized property and manager. Great place for relaxing or family board games, movies,sitting on the deck or in the hot tub or a basketball game. Very comfortable and relaxing. Beautiful quiet view of sunrise with pine trees, panoramic water and snow-capped Cascades. Voted top area in Washington State for bird watching with a large diversity of species. Eagles soar by all day long! All bookings require a conversation prior to approval. Please check your email (including your spam folder) within the 24 hour time period in order to respond in time. All holiday weeks are subject to higher nightly rates and possible one week minimums. Contacted us for adjusted rates on shorter or longer stays. No tax is collected on rentals of 30 days or longer.